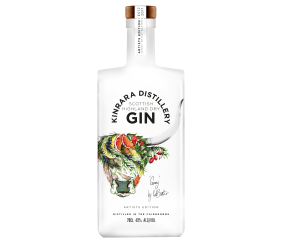 Our Artists Editions will be a permanent feature of the Kinrara gin range. We aim to support and showcase some of the best young artists that Scotland has produced. Each edition will be a limited release and we hope that over the coming years we will amass quite a collection of Scottish artwork and a fantastic range of very collectable bottles. 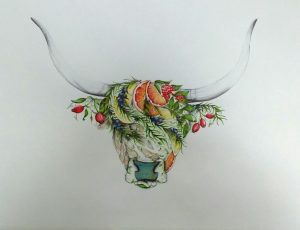 The first two releases from our Artists Editions will feature the work of Kat Baxter a young Scottish artist from Dundee. Based in Dundee, Kat is a Scottish artist who graduated from Duncan of Jordanstone with a degree in Fine Art. Her drawings come from a love of flora and fauna; what were once Kat’s doodles and sketches have now developed into her favourite style of mixing drawing and painting! We then used specialist bottle decorators, Seaways Services, to bring this illustration to life. No plastics are used and we utilise organic inks and transfers before baking the bottles in an over for two and a half hours to bake the enamel into the bottle. These bottles will be a great collector’s item, full or empty!! 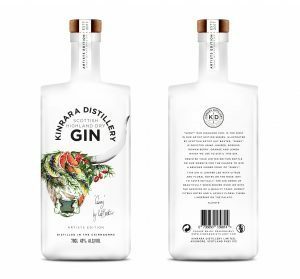 If you have been lucky enough to get your hands on one of the 2000 bottles of “Ginny” then please register your bottle below for a chance of winning the only print, signed and dedicated to you by Kat Baxter. A fantastic addition to any gin bar, den or house! Please ensure you keep your bottle, empty or full as proof of purchase as a picture will not be sufficient. Once we sell all 2000 bottles we will hold a prize draw and contact the lucky winner.